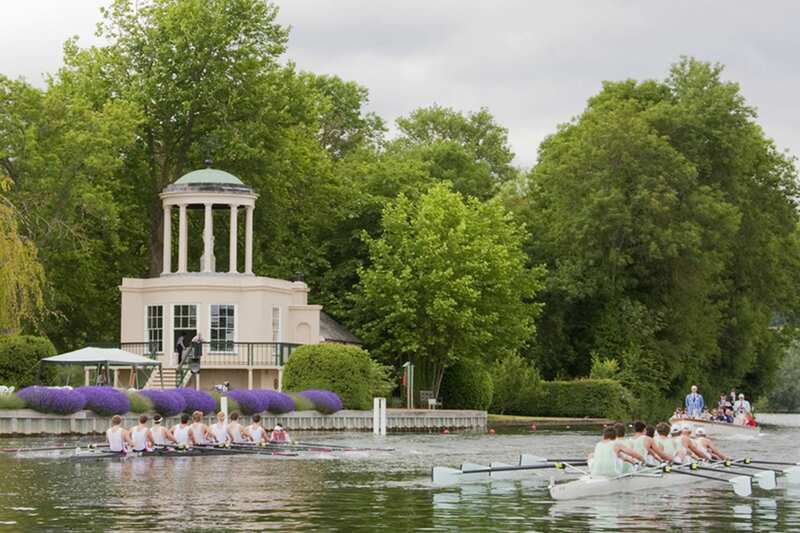 Swiss Farm has been providing camping and accommodation for Henley Royal Regatta visitors since 1946.
Henley Royal Regatta is undoubtedly the best-known regatta in the world. It is a highlight of both the summer sporting calendar and the social season. The Regatta attracts thousands of visitors over a 5-day period. Spectators are thrilled by over 200 races of an international standard, which includes both Olympians and crews new to the event. In addition to watching the racing, visitors can take in the ambience of the enclosures, enjoying the array of restaurants, bars and shops available, as well as the charming views of Henley and the River Thames. We regret that during the Regatta we are unable to accept day visitors. Full paying customers only please. The 2019 regatta runs from Wednesday 3rd July to Sunday 7th July. Additional adults £15.00 per night (only when booked prior to the start of the event. Gate price will be considerably higher). Additional Adults £17.00 – £22.00 per night (5 nights min, only when booked prior to the start of the event. Gate price will be considerably higher). For extra adults visiting for less than 5 nights please see the camping rates below. Please note that there is a minimum booking period of 2 nights. Saturday night only will be £45.00 per person.